Explain Santa knows we don't have a chimney so he sent us a key to hang on our front door. 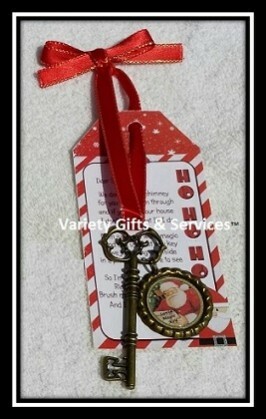 Hang this special key on your door knob for Santa to work his magic. Perfect way to create some Christmas fun your children and family members to enjoy. Start a tradition that can be handed down for generations. Includes a key, poem and a key charm. NOTE: Ribbon and Santa image may be different from the photo – depends on availability – you won’t be disappointed.